iAuditor is SafetyCulture’s popular software platform that is designed to empower teams to manage quality and safety efficiently. The platform digitizes safety audits and construction site inspections by providing a more flexible way to create checklists, inspect, and generate audit reports straight from the convenience of a mobile device. This mobile inspection app is one of the world most-used software in a number of industries including Engineering, Construction, Hospitality, Retail, Transport and Logistics, Mining, Aviation, Manufacturing, etc. The feature-rich app has been sending ripples of trust and convenience to project managers by giving them a smart mobile checklist that enables them to monitor what is working and what’s is not in all the sites they are supervising. Above all it allows them to take actions from wherever they are. 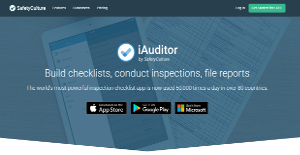 SafetyCulture iAuditor gives you the chance to create a team and standardize your audit system by locations or groups then share the audit templates to all the team members. As a project manager, you will be impressed by the capability to convert all your Excel spreadsheets or paper inspection forms into customized forms in just minutes using the user-friendly template builder. By shifting to smart inspection forms you will manage all your documents electronically in one location. With this platform, inspections will be no longer strenuous and stressful. You will complete them from any virtual location using your tablet or any other mobile device, whether there is an internet connection or not. The app also gives you the freedom to quickly capture information and include location, photo, or digital signature. This makes the process simple but powerful in ensuring everything is done the correct way every time. You will also be able to automatically generate detailed reports and at the tap of your finger, customize and share them with each team member. These reports are also stored securely and can be retrieved easily for future reference. Moreover, this platform gives instant feedback and all the data you collect is synced into the powerful analytic tools thereby giving you an instant visibility of compliance, accuracy, productivity, and more. This gives you the chance to track safety and quality metrics and evaluate risk to make improvement in real-time. If you are interested in iAuditor it could also be sensible to investigate other subcategories of Best Construction Management Software gathered in our base of B2B software reviews. Each company has its own characteristics, and can call for a specific Construction Management Software solution that will be fit for their business size, type of customers and employees and even specific industry they deal with. We advise you don't count on locating an ideal solution that is going to be suitable for each business regardless of their background is. It may be a good idea to read a few iAuditor reviews first and even then you should remember what the service is intended to do for your company and your workers. Do you require an easy and straightforward solution with just essential features? Will you actually make use of the advanced tools needed by pros and large enterprises? Are there any particular tools that are especially practical for the industry you operate in? If you ask yourself these questions it will be much easier to get a trustworthy solution that will fit your budget. How Much Does iAuditor Cost? Enterprise Plan (for large teams) – contact the vendor for a quote. We realize that when you make a decision to buy Construction Management Software it’s important not only to see how experts evaluate it in their reviews, but also to find out if the real people and companies that buy it are actually satisfied with the product. That’s why we’ve created our behavior-based Customer Satisfaction Algorithm™ that gathers customer reviews, comments and iAuditor reviews across a wide range of social media sites. The data is then presented in an easy to digest form showing how many people had positive and negative experience with iAuditor. With that information at hand you should be equipped to make an informed buying decision that you won’t regret. What are iAuditor pricing details? What integrations are available for iAuditor? At the moment, iAuditor offers a streamlined integration with Zapier.